For our wedding, Jon and I got gifted an ice cream maker, even though we didn't put it on our registry. And to be honest, I was thinking of returning it... Thankfully I decided to keep it and give it a try. And now... I'M OBSESSED. It is one of the funnest new hobbies for me! 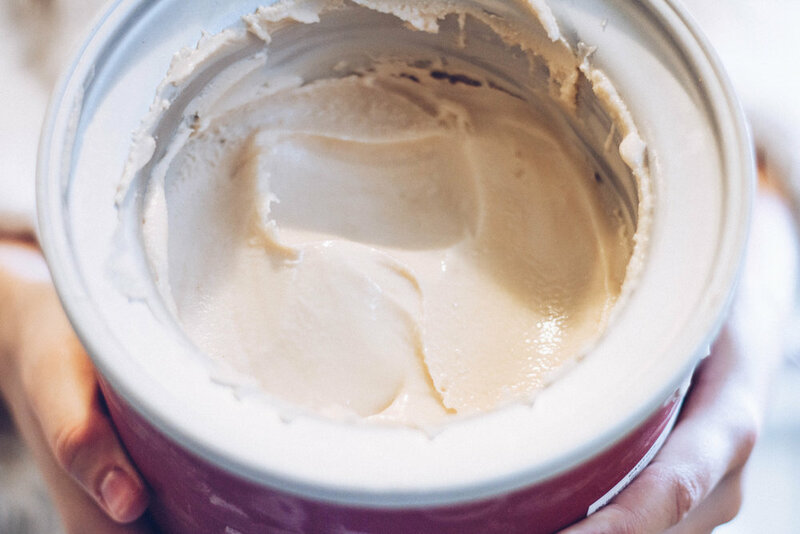 The process of making the ice cream and coming up with new and creative flavors is extremely satisfying. 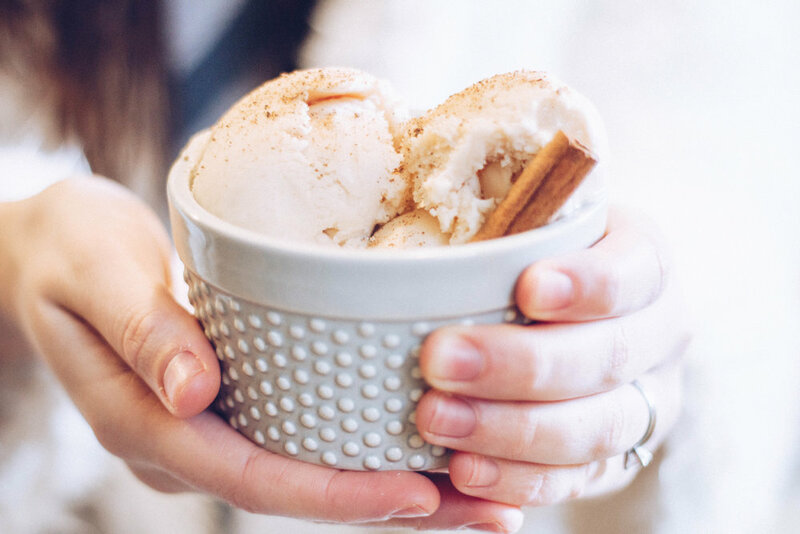 Not to mention, the end result is ICE CREAM. you can't go wrong. 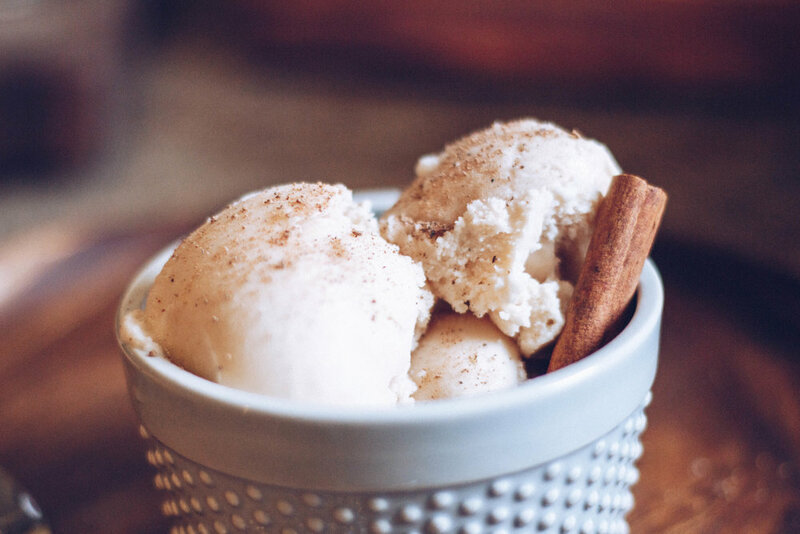 I just recently tried this recipe out for Horchata Ice Cream, and I was pleasantly surprised! It tastes just like that milky-goodness you get when you go to Taco Express and order a breakfast burrito with a large horchata on the side. If you're a fan of the drink, you'll definitely want to try this recipe out! - To blanch the almonds, bring a saucepan of water to a boil and add the almonds. They should only stay submersed for 45 seconds for the skins to soften. Once drained and rinsed with cold water, they should slide easily out of their skins. Set aside. - Next, I used a clean coffee grinder for this step, or you can use a spice grinder if you have one. Grind the rice and cinnamon stick until fine. Fill a large mason jar with the pulverized ingredients, and top with almonds. Pour about 2 cups of water into the mix, shake well, and refrigerate for 10-12 hours. - After the given time for the first step, take out the mason jar and pour all ingredients into a blender. Add one cup of water, and blend until the mixture is completely smooth. - This step is really fun! You're going to need a fine mesh sieve and a thin cloth to line the insides. Pour the blended mixture into the cloth that is lining the sieve, and let all the liquid drain into a medium sized bowl. I took the cloth and squeezed all of the excess liquid out, to make sure I got all I could out of it. After draining all of the liquid, there should be a grainy pulp left over, and you can toss it in the trash. There should be about 2-2 1/2 cups of horchata left from the draining. - Take the mixture and pour into a saucepan on medium heat. Add the sweetened condensed milk and warm until the sides start to bubble a bit. Make sure you do not let the mixture boil, or it will start to clump. - While the mix is warming, take the egg yolks, salt, and cornstarch and whisk together in a small bowl. Don't whisk too long, only enough to change the color slightly lighter. Take the heated horchata and slowly pour half into the mixture, about 1/4 cup at a time, still whisking. After you've added half of the horchata, put the saucepan back onto the stove and add the whisked mixture into the rest of the horchata. Continue to heat until the mixture starts to coat the spoon you're stirring with, which should take about 5-7 minutes. Take off the heat and put the mixture into a medium sized heat-resistant bowl. Put that bowl inside of a bigger bowl that is filled with ice, and stir the mixture until it cools to room temp. As soon as that happens, place the bowl (covered) into the refrigerator and let sit for 6 hours or more. - When the mixture has chilled, take out and churn in an ice cream machine, using the directions your machine provides. If you're dying of anticipation, you can eat it once it is in soft-serve form, or you can put it into the freezer until it's firm. Scoop some out when the time is right, Sprinkle with a little nutmeg, and eat till your fat!